American actor best known for roles in films such as Dallas Buyers Club, Panic Room, Requiem for a Dream, Fight Club, Lord of War, American Psycho, Alexander, Mr. Nobody and the TV series My So Called Life. He also Sings in the band Thirty Seconds to Mars. On his twitter he once mentioned in regards to his height and weight: "I'm 5'11", around 148 pounds, and a size 11 shoe". I've watched Leto for a long time and I don't see him as only 5'9" especially next to people like Will Smith, Colin Farrell, Joel Kinnaman, Matthew McConaughey, Till Lindemann and Jennifer Garner. He looks more like 5'9.5" for me. Please, Rob, give him an upgrade to 5'9.5" or at least 5'9.25". it's 50/50 on Leto, he is one of those who may well be 5ft 9.25, although his own claim of 5ft 11 seems impossible, or even 5ft 10. 5'9 and 3/8th inch exactly is how Leto looks with Jimmy Fallon. Rob 5'11 182cm peak is possible to him? I just can't see it...the most I'd even attempt to argue is 5ft 10. @Kyle in Hollywood's mind the taller you are the more power you have and more you sell. Click Here Make no sense if Fallon listed 5'11 1/2 and Jared Leto still keeping 5'9. I would dare to say Fallon will be 5'11 flat to make Leto 5'9. Leto had an obvious 1cm less footwear than Fallon is this clip. Looking at Leto next to 5'11 1/2 listed Jimmy Fallon i could see 5'9 1/2 not under. But more or less Fallon could be a 5'11 1/4 guy so Leto is not under 5'9 1/4. What's up with every 5'9 guy claiming 5'11? Rob, how much do you think Leto weighed as Mark David Chapman in the movie Chapter 27? He was alleged to have put on more than 60 pounds, but it's not clear exactly what his starting point was. Oh my, that's what I came up with this evening when comparing Jared with Brad Pitt in 'Fight Club', based on the assumption that Brad is 5ft11, which I strongly believe. However, he does look a weeny bit more than 2" taller than Christoph Waltz's 5ft7, so for that reason I would ideally go for an eighth of an inch over 5ft9, but I can't, so 5ft9 will have to do! Waltz said himself he's 170 cm so that points much more to Leto being 175-175.5 cm. I thought he might be at least 176 cm myself, but then I saw him the same height as the Oscars as Stallone(currently 174, imo) while Leto had loafers that add about a half inch less than Stallone's dress shoes that night. Waltz is 171cm so Leto can't be under 176cm. I am so suprised that he's listed as average! He so looks 5'11. I've always thought of him as a slim 5'11 dude. His claim makes me believe it even more! Leto does look 176 if McConaughey is even 179 and I doubt Matthew is below that and he looks it even if I'm right about Colin Farrell being just 5'9.5". But 5'9" flat actually looks spot on above if Waltz is the height he claims to be. Stallone also isn't above 5'8.5" these days and Leto looks about the same height with loafers that add maybe a half inch less than Sly's dress shoes: Click Here So he really doesn't look 176 even if Sly is still the full 174. Jamie Foxx doesn't have a "false listing" as he's listed the height he claimed and the difference is Leto looked possibly a bit over 5'9" even years ago in Fight Club, iirc as opposed to Jamie's late "growth spurt." Both 5'9" and 5'9.25" are arguable for Leto so not surprising the average guess is right in the middle. 5'9 is impossible. 5'11 claim is more impossible. But Jared Leto always look between 5'9 1/4-5'9 1/2 and really make Matthew McConaughey look nothing over 5'10 if Leto still listed at 5'9 that is truely a false listing just like Jamie Foxx. 5'10 way too high. Jared generally look a strong 5'9 1/4. I think he deserved a 1/4 upgrade just like Christoph Waltz. 00:26 he's standing straight beside Ryan. Assuming neither are wearing lifts, what would you guess his height is? Maybe 3cm but since he had close to 1cm less sneaker you could argue a strong 5ft 9 range. @Lori said on 23/Mar/18 Seriously if you don't know that. Tom is a lift wearer. Every male visitors knows that. Tom fools alot of women that he could look 5'8 but the truth he is much shorter than Jared Leto if put them barefoot. Tom is 5'7 and Leto 5'9.5". Click Here with 5'11.25" Jimmy Fallon. 5'9.5" assurd for Leto. And as someone on here pointed out, camera angles are used all the time in filming movies especially if one of the primary actors is noticeably shorter than the other cast members. This is especially true with male actors. When Tom Cruise was married to Nicole Kidman the story goes that Tom didn't like Nicole to wear high heels because she is 5'11" and he didn't like her appearing taller than he did and he supposedly always wears lifts in his shoes. If you will notice when people are walking the red carpet the camera people will film at certain angles when they are shooting the actors up close versus at more of a distance when the person is being shot full frame. Oh, the magic of Hollywood! Average men's shoes add 1-2" of height which makes them appear taller. Tom Cruise is said to be 5'9" but looks shorter than Jared but Tom also has a stockier build than him. A slimmer physique can make a person appear taller. The noticeable height increases are heels, lifts or just general thick insoles. Rob how can someone 5ft9 look like this next to a 6ft1 guy? Leto at times has looked a 5ft 9.5 guy, Will at times can look 6ft with loose stances. I'd give him 176. I think he'd edge out most guys listed as 5'9" on this site. i can confirm what i said rob mate. hes the same height as Barkhad Abdi. he looks great at 46 years old. i hope i age as good as he does. this is a joke ... Jared Leto is 175 cm max. Yeah, I can buy 5'9.25"! So that's what goes in my box! @ Nik - 🏦🏃.... 5ft9.25! He is clearly 5'9"! Not a penny less! Lmao, robs got him underlisted a few Cm, he’s 177 Cm, that’s not short lmfao. Are you from another world by any chance? A 5'9" guy getting called short shows how much 5'9" is devalued. It's a completely average height, not short at all. Stood next to him at the Larchmont Farmer's Market. I'm 5'9", and this guy was noticeably a couple of inches taller than me (without the aid of any particular footwear). He is at the minimum 5'10" without a doubt. 175 cm or 175,5 cm at day. He doesn't look 5'9 to me - not a flat one anyway. For someone who manages to appear taller than Matthew McConaughey in boots, i can't really see him being nearly 2 inches smaller as then they would be lifts. I honestly think 5'9.75-5'10.25 is fair. 176.5cm is absolute min for Leto. If Pitt is 180cm and McConaughey 179.5-180cm then Leto had to be 177cm. SPOT on @junior, even @Del Mar said during fight club pitt didn’t have 5 Cm on Leto but rather 3 tops. I can't see 4.5cm listing between Matthew McConaughey and Jared Leto. I wonder if Leto is more like 5'9.5" and McConaughey 5'10.5". Matthew McConaughey can only look easy inch on Leto. Jared Leto next to Joel Kinnman (6'2) both flat footwear Click Here: Looks like 7 7/8 difference. Jared is 5'8 . trp, Maybe he wouldn't tower over him simply because 2.5in is not enough for "towering" ? Plus, there's a chance of Fallon being closer to 5'11 flat and Leto being a bit over 5'9. So here you go, they might be just 2in apart, and 2in is never "towering". Wouldn't a 5'11.5" Jimmy Fallon tower over 5'9" Jared Leto? Jared's only wearing checkerboard slip on vans, so how could he measure up so well to him? I see 5ft10 in the picture. Another good listing, 176 upgrade is needed. Agreed, Letos a decent 5'9.5. @Del Mar, I could shake with you on 5'9.5, but 5-6 cm between bale and Leto is weird... but not impossible. Del mar, 177/178 for Leto is a bit too high man, he isn't above 6 cm taller than waltz imo. 175, 176 max Our friend Leto is. 5 ft 8.75, Jared wears lifts all the time especially trying not to look like a shrimp next to 5"11+ listed guys like bale, pitt, meat loaf and norton in the cult films fight club and American phsyco. If it weren't for those elevators while norton bashed Leto in fight club the height difference would have been huge! Either he wears big shoes or he deserves a slight upgrade. I wouldn't give him more than 174 judging by pics of him with margot robbie and cara delevingne. Looked a solid inch taller than 5'8.5 Ralph Macchio. 5'9.5 for me. Considering the pictures here, if Waltz is really 1.70 and Mathew McConaughey 1.83, I'll give Leto 1.77. 5ft8.5 , 140lbs max 148 with his clothes and shoes maybe, his height claim is no doubt with some big lift shoes. In Suicide Squad he is hardly much taller than Margo Robbie. I met him while he was wearing sneakers and he looks 5'11" as claimed. I'm 6'1"
Jared Leto 100% wears lifts, but he doesn't always wear them, hence his height always varies, there is solid proof of this, look at how his height varied on the Ellen show, he TOWERED over her in his first time, then after his Oscar win, barely looked taller than her (wearing very flat footwear). No he didn't become tall at all. Just camera angles deceived you. Have a look at those pics. It's a common technique to make someone look taller than s/he actually is. Click Here same height with Cameron Diaz (173cm)??! Click Here same height with Uma Thurman (181cm)??! Also some time ago he preferred to date with short girls(Emilia Clarke-157cm) (Scarlett Johansson-160cm) (Soleil Moon Frye) - 155cm, but nowadayas he prefers to date with models, maybe he did surgery on his legs? What is his head length, Rob? Editor Rob: very average I'd say. Rob can you add Chino Moreno from Deftones? He's said to be 5'9. Also Jared Leto and Chino are performing in this video together. They look very similar in height. Can't quite see their footwear though. Around the 4:53 mark. Looks 5 8 especially with is skinny build and that's in shoes. Reminds me of a 5 6 dude I knew told everyone he was 5 8 I towered him. Obviously the smallest joker minor pun intended. Even Ethan hawk looks big by him give me a break weak 5 8 tops. I'm 174cm/5'8.5" barefoot in evening and he looks very slightly taller than me in barefoot photos. I would say 176cm/5'9.25"
Mr. Leto is 5,9 1/2 in the morning without shoes.He dips down to 5,9 at night without shoes. The rest all just depends on the footwear it could vary from 1 inch to to an inch and a half depending on the style of shoe. A handsome young scamp this one! He was also in 'Girl Interrupted', playing Winona Ryder's boyfriend! I've just read above that he has said he's 5ft11 - well poppycock to that! He's 5ft9.5 at the most! He made Christian Bale look taller than 6ft in 'American Psycho' and he looks quite undersized in 'Fight Club' compared to many of the others! a completely different type of role AND he looked and sounded like I'd never seen him before! I was impressed and amused to find out it was Jared! I think the long hair suited him! Even so, he still looked of rather average height in that film! Sorry mate! Robs, what's the deal with this guy? He looked same height as glenn in their photo, in your YouTube video you list him as 5'8-5'9 yet you have said he pulls off near 5'10 some times and he wears converse a lot so he doesn't wear lifts... he looks about the same height as Mcconaughey who is supposedly almost 5'11 or even a hair taller sometimes. How can he look anywhere from 5'8 to 5'11(which he claims) without lifts?? Editor Rob: in some photos he might just be maximum posture, the other guy an inch off his maximum...the fact a sub 5ft 7 guy like G didn't think he was 5ft 10 goes to show he maybe has an extra trick up his sleeve. Rob, why is he taller than Mathew McConaughey? Seems like most think he is under 5 ft 9. I think he can pull off 5 ft 10 , but he's not. Editor Rob: there's only 8 guesses, I think you need more than 30-40 to get a general idea. Says who? Where have you been? This video with jimmy fallon at the miute 1:19 they stand bext to each other what do you think jared leto's height ? Editor Rob: I really don't know if that would happen, but we can hope! Would you say 173-174cm is out of the question Rob? Editor Rob: he can look it on the odd occasion, but I think this listing is ok, in fact he could pull off 5ft 9.5 with some people. Rob, what about his older brother Shannon? He looks between 5'6 and 5'7. Editor Rob: Shannon did claim to be 5ft 9...he can at times look 5ft 7-8 zone. 2007 watched 30 seconds to Mars live and on stage even when he was standing closest to rest of the audience he still looked shorter than the guitarist and bassist and when he came down and security escorted him and held him by the belt when singing with the front row people he was still shorter and the event security guards made him look tiny. He was on Jimmy Fallon, last night, and I was a bit surprised at how much smaller he looked than the 5'11.5" Jimmy Fallon. Though, this is still assuming Jimmy doesn't wear lifts. Hey Rob, this guy is tricky in my opinion. Even the pic above is not so clear: look at the shoes of Waltz and then move on Leto's, the instep is visibly higher than Waltz. At least an inch inside. What do you think? Editor Rob: half inch lifts aren't huge, but they can be used in shoes and many wouldn't be able to tell. I think the magic number is between 173 - 174 Rob. 175 if we're including the tallest hair on his head. 173cm max but look why is everyone towering over him ? 5,10 with shoes. Wakes up at 5,9 1/2. Dips down to 5,9 at nite with out shoes. Thst is it. At best in the morning could be in the 5,10 1/2 with shoes. Sometimes he put on the big back boots now those can put him at 5,11 that's why he claims 5,11.
which might be unlikely given the style of shoe he has worn at times. Editor Rob: he can pull off 5ft 9.5 at times yes. Editor Rob: there's not enough to really tell from that shot, would be hard to say if he wore any lift or not. My 15 year old cousin is 5''9 and took a pic with him and Jared looked a lot shorter than him and my cousin is wearing flat converse shoes and has a lanky posture. Priscillq - Shannon Leto (his brother) is really really small. I'd say he's about 5'5. I think that's the reason people assume Jared is tall (he does look tall in certain photos). Because he looks big compared to his brother! Take a look at some pictures of Leto, with Leonardo DiCaprio (6 foot tall)..........Leo towers over him. I'd give him at least 4 inches on Jared Leto. I seriously think even 5'9 is too generous. I laughed when I saw his claim that he is 5'11........Jared Leto is really small. I met him once after a 30 Seconds to Mars show in late 1990s, and he was about the same height as me (5'8). I think even 5'9 is generous. I'd say he was a solid 5'8 but nothing more. No where near 5'10 He is about 5'8 half. He's a solid 5'10 with shoes,depending on the Footwear he can be a bit taller. So whether he's 5'9 or 5'11..who cares he is an incredible person, that's what matters. People are we talking about how tall he looks with shoes on or off? because people are saying he looks 5 feet 8.5 inches. He has shoes on remember. He may look 5 feet 8.5 inches with shoes but without shoes his physical height is 5 foot 7 inches. So I will say Jared Leto is 5 feet 7 inches. Rob's listing looks about right. He looks 5'9.25 with Waltz, and he can pull that off quite often I'd say, but 5'9 is a fair shout. If christopher waltz stood up straighter his eyes would match jared letos nose or an little higher, he's actually losing an little height in the photo, and his head is an little under his hairline. Rob, what age does a man start to lose height? Jared leto 44 at the moment and seems like he'll be losing none anytime soon. Do all people lose height as they get older? Editor Rob: a tiny percentage might lose only a fraction by their 70's, but the average will be about an inch for males and nearer to 2 inches for females by 70's. Wear and tear and disc damage could always lead to earlier loss. From 40 to 50 males will tend to lose only a small fraction - most won't realise they have lost anything because it is literally that - maybe a fraction. Airport in 2003' (he was boarding the flight with Cameron Diaz and a few friends). I'm a weak 5'10 (at night w/no shoes) and he is definitely 5'9 - no more no less. Thin build but not skinny. Rob what you think is his morning height? No taller than 5'9.5. See this picture standing next to Val Kilmer listed at 5'11.5 and he looks several inches shorter in "normal" footwear: Click Here As he became more and more famous he "grew" taller as did guys like RDJ. what do you think is up his brother shannon ? [Editor Rob: he claimed "Hahaha no I'm 5 feet 9 inches with heals 6 ;)"
He can look strong 5'8 up to 5'10 , 5'11 is a joke. 5"9 without shoes 5"10 with shoes. That's his height. Rob, isn't a shoe size 11 big for a 5'9 man? Do you think he could be lying about that too?" I have a mate who's 5'7 and wears a size 12 shoe. I also have a mate who's 6'7 and wears a size 12 shoe and a mate who's 6'1 and wears a size 12 shoe. I also have a mate who's 5'8 and wears a size 8 shoe and a mate who's 6'4 and wears a size 11 shoe and I have a mate who's 6'0 and wears a size 8 shoe, and a mate who's 6'0 and wears a size 13 shoe. I am 6'6 and I wear a size 15 shoe. You see how shoe size really doesn't correlate with shoe size, same with hand size. One of my mate's who's 6'1 has about a 7.5" hand and my dad who was only 5'9 had about an 8.5" hand. 175cm, he can possible be 174cm. In regards to the pictures with Vika Levina, she's wearing wedge sneakers so it's an unfair comparison. Rob , what would you guess his weight in The Kill Video if he's 148 nowadays ? okay I'm going to be honest, I've met Jared leto twice and he is a solid 5"10 1/2 with shoes. he stood face to face with me and I'm 5 10 exactly. he either was half an inch taller or just a hair taller than me. that's why he can claim 5 11 depending on his footwear. Is the 148 lb his weight now or when he lost for Dallas Buyers club ? Look at the pic on this page, the gentleman next to him is self confessed 170cm (5'7). Do you see 4 inches there? His eyes come to Jared's nose a solid 2 inch difference. Good listing. Why do 5'9 guys claim 5'11? Fair enough Rob. My personal guess is he wakes up at 5'9", and dips to 5'8.5" during the day. You think he's occasional lift-wearer too? I wouldn't put it past him. He seems very appearance-conscious. 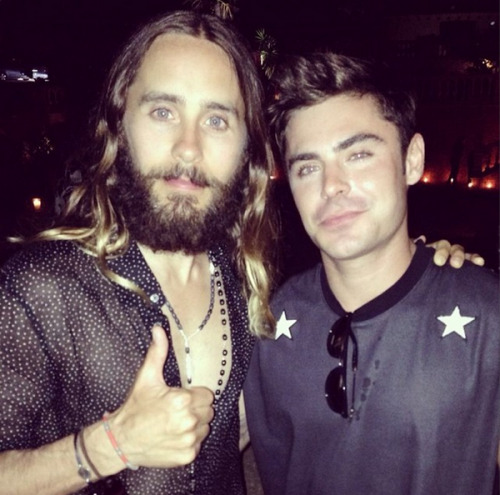 This is a confirmed 5'6.5" man standing next to Leto. Even accounting for footwear advantage, it makes it hard to believe anything beyond 5'8.5" for him. And Rob, I normally wouldn't link to photos of G, but I wanted to make an exception for this one, as Leto seems to be one of the more elusive heights around here, and here we have a photo of him standing right next to, in equal posture, someone you've obtained an exact measurement of. LoL, I don't know. A half-decent pair of elevator shoes costs between $200-300 minimum, and I remember G remarking on quite a few occasions he wasn't exactly bleeding money. G pic aside, I'm not convinced Leto is anything above 5'9", and not a strong one at that. Shawn, never trust a photo with G. He was probably wearing 2 or 3 inch lifts. Rob, I don't know if you've saved it, but you should go through your collection and see if you saved the "G & Leto" pic. The difference between them was minimal, if any. I distinctly remember even Glenn being "shocked" as he was expecting Leto to be taller. I lump Leto in the same category as guys like Stallone, Depp, Gibson, Farrell, Damon, etc. All strong 5'8"/weak 5'9" guys that try to get away with claiming 5'10"+. @ just like jared does cause well who wants to be short? Rob can you add a photo and add Fight Club, Mr. Nobody, American Psycho, Alexander and Lonely Hearts? 148 lbs on 5'11 would look thin but not quite Leto skinny. Beckham during his playing career was about that. Steve Vai at 6'1 and 150 pounds is proper skinny. Tunman, I think the fact is that if he's really that weight, there is no way he's 5'11" given how thin that would look. I'm 5'11" and 143 lbs, myself, and as thin as Leto is, there is no way he's as tall as 5'11" if he's 148 lbs. If that's his actual weight, as Shawn said, it'd be very hard for him to be above what he's currently listed. @Shawn at 5'9.5 I never exceeded 143-4 Lbs and never went under 127.I can imagine many guys being as thin as that but that's quite rare I admit. Actually many sportsmen especially long distance runners and some cyclists could that thin,but yeah,it's pretty thin on an average person with normal activity. @juan Zedd is claiming 177 cm. He doesn't look 177 cm, though! Julie then you are not 5'10. Rob looked taller next to Glenn than Leto did. I won't give him anymore than 5'9", and a weak one at that. Does anyone realize how skinny 148lbs would look on someone who genuinely was 5'11"? once i was standing right next to him and he was actually a bit taller than me. i'm 5'10. Haha 5'11 is a height that no one honestly claims in hollywood, if your 5'11, you claim 6ft, if your 5'9/5'10 you claim 5'11. Jared leto is an example of that. Not over 5'9. I think he's a weak 5'9. 5'9 guy claiming 5'11 ..He doesnt look anywhere near 6 foot which a 5'11 guy can pull off at times. Also judging by photo his size 11 shoe claim is off as well. I wear size 11 UK shoes 46 here in Europe and i always get comments from people about having boat feet. Looks typical average range 5'9-5'10 . I've just met Jared Leto here in Argentina. I'm 6'1" and he was like 5'11" like he claims. He has an impecable posture and a small frame body. I don't know if you've ever met him, but definitely he's not 5'9"
Saw him last week at a linkin park/30 seconds to Mars concert - he did some autograph signing and I say he's around 5'11 with shoes - probably 5'9.5 without , definitely more than 5'9 and less than 5'11 . Rob don't you remember the pic of Jared Leto and G? They looked right around the same, now even if Glenn was in those boots that still leaves a 5'8-5'8.5 Leto. Guess he forgot his lifts then. How can he be as tall as Andrej the model. Her stats are 6'2. And yet he looks 6 foot next to her? Not hating or anything on jared hes a cool dude and does his thing. But just general curiosity. Someone in the thread was asking for the pic of Jared with Cameron Diaz where he's barefoot. There's this one. There's a slope advantage to him but he's still waaaaay taller than her. Even if she's 5ft8 not the 5'9 she claims he's still got several inches on her, I'd say. For the record (stay with me) my choir were recently getting ready to perform and our choir leader was making us line up in height order. I would have sworn blind I had two inches on this guy but everyone else said he was actually a couple of inches taller than me. Its really hard to work out who is taller when you're standing next to someone. So people who've stood next to him in a bar and thought they could guess his height could be wrong. He's so skinny though. He's built kind of like I was at 17 and he's approaching what, 45? Oh c'mon he doesn't look much shorter than Bale in American Psycho. Glad to see the Academy agreed and rewarded with him and McConaughey. He can look 174 but I doubt he's under that. should probably add Dallas Buyers Club to his bio Rob. Considering he won an oscar for that. Seeing him at the Oscars last night, made me see him as someone on the shorter side. I think he is someone who doesn't always have great posture, and wears strange footwear - making look just shy of Mathew McConaughey at times, and at others several inches shorter. I think he is 5'9", but wouldn't be surprised if he was close to 5'8". To me, he always reminded of having a similar height/build to Johnny Depp. Both are listed at 5'9" on this site, but I think both are probably closer to 5'8". Seeing as how we've gotten Jared's height pretty close, perhaps that was a better picture to put on Joe Jonas' page. Because, very obviously, Jared is not 6'0", not even close. Mr. R, what's your estimate on Jared? I have seen Jared twice in the last few months, and both times, he was wearing clunky boots. be a smidge under 5'9. IMO both he and McConaughey deserve Best Actor awards at the Oscars. No way was the performances better in 12 years a slave. He's got a very good chance of winning Best Supporting Actor at the Oscars this year, he was terrific in Dallas Buyers Club, that#s why he's shot up to 5'11 :-] Barely 8 stone in that film and probably a 24 inch waist or something LOL. Yeah he can look a weak 5'9" agreed. Yep, he's not quite 5'9". It's guys like Leto where I wish we still had Glenn's pics. I still remember it clearly... barely an inch on Glenn. Assuming G had footwear advantage, he's 5'8.5". Even G stated 5'9" for him. Having looked at some photos with him, now I doubt if he is 5'9. 5'8.5 seems to be true. Saw his band, weak 5' 9". His 5' 11" is laughable. Just noticed he said on twitter that he's 5'11". So he's obviously grown three inches. He said on his old blog a few years ago that he's 5'8". Think it's deleted now, annoyingly, but what can ya do. Anyone who say they've seen him, and say he is 5'11, are either blind or full of crap!!!!! Was at rooftop of Thompson in manhattan, and saw him there. He is at most, MOST, 5'9!!! He is very short!! This guy looks like a weak 5'8. Well, at times he actually appear in the 5'9 range (in photos), but I can't see him at that height really .. Saw JL tonight at a screening of the new movie Dallas Byers Club with Matt M. Leto stood on the stage and he was clearly not the 5-9 he claimed to be. He is closer to 5-8.5 without shoes, and MM is just over 5-10. Rob can you tell me how there are pics where he looks much taller than 5'9 cameron diaz and he's barefoot? A friend of mine who's 6'4.5 met Leto in Norway yesterday, and he seemed a good 5'9 or maybe even a bit taller in that photo, can't see their footwear though, I thought he might have worn a boot or something whilst my friend allways wears converse. Leto was a bit over the top of his nose. He's 5'9 minimum for sure. He's legit 5'9", maybe a little taller.. 5'9.25" sound good. @Arch Stanton he is too slim he should be at least 168 pounds. he is hard to judge because in my opinion he always wears lifts and still just looks average. Looks 5'9" but can't be much more than 140 pounds usually. and not an ounce of fat on him. Bodyfat usually near 6% but this weight loss for his role in McConaghy's film is insane. I can't imagine how long you'd have to go without eat to have that waist, its shocking. Looks like a 5'9 guy to me. Definatley 5'10", was only at the most an inch shorter than me (yes, I am 5'11"). Rob, i just watched Panic Room again...and i came on here to find out how tall Dwight Yoakam is but you haven't made a page for him yet... on other websites he is labelled as 6ft...i don't really buy it because he only looks an inch taller than Jared Leto and is dwarfed by 6'2 Forest Whitaker. Could you please give me an estimate? Thanks very much. That half an inch is important. Click Here tryin one more time to post the link if it doesn't work just type both their names in google or yahoo images search and you'll see what I'm talking about. pic of him next to Justin Theroux who's listed as 5' 9" on this site. I was an extra in a movie eventually called "Highway" in '99, which Leto starred in. I had a chance to be right next to Leto with non-raised shoes, on concrete. I am 6'2", dead even..and I had 6 inches on him, easy enough. He's 5'8", no more.